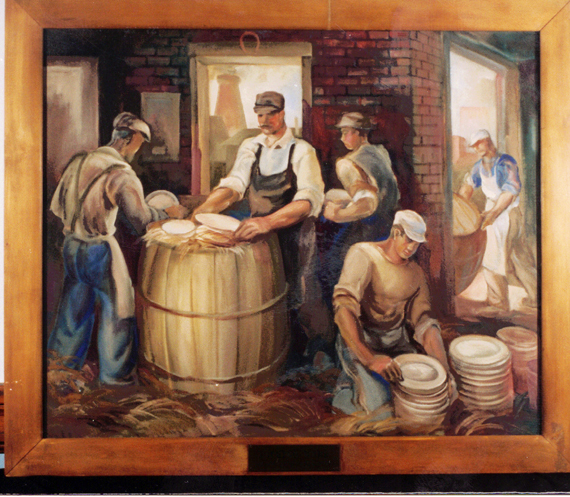 Nowhere is the detailed process of 19th Century pottery manufacturing better depicted than in the paintings of a Youngstown artist who created multiple works for East Liverpool in the late 1930s. 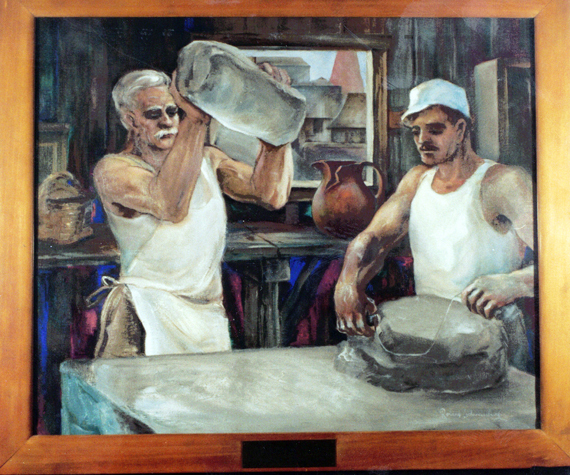 Roland K. Schweinsburg created an upper wall mural for the east lobby of the Post Office building on Broadway, now the Museum of Ceramics, and painted some 18 framed oils of potters at work. The mural depicts the original yellow ware pottery built here in 1839 by James Bennett at the west end of Second St., a site long since washed away by the river. He was an illustrator and instructor at the Butler Institute of Art at Youngstown when retained under the Works Progress Administration to undertake the mural. The Civil Works Administration and the WPA sponsored various projects aimed at putting to work people unemployed due to the nation's economic difficulties of the Great Depression. Not only were major construction tasks undertaken, such as erecting East Liverpool's City Hall and the Patterson Field Stadium, but art projects were authorized to aid artists, writers and craftsmen and to raise community cultural levels. 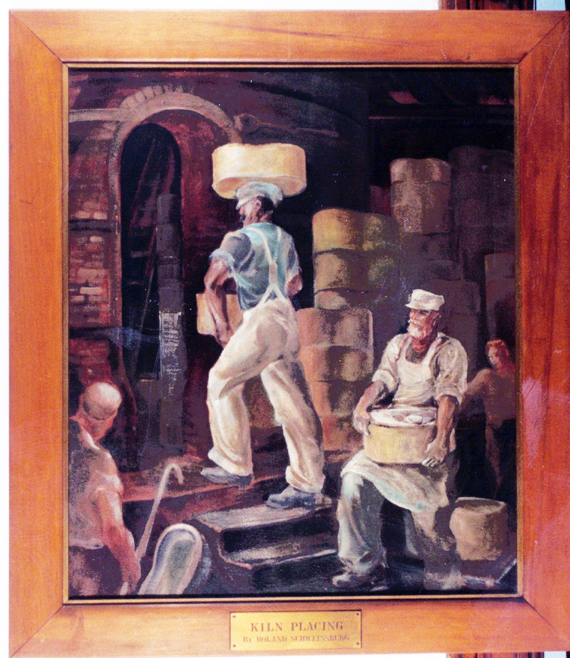 Schweinsburg was also contracted in the late 1930s by the Chamber of Commerce for the paintings which were placed in the custody of the East Liverpool Historical Society. 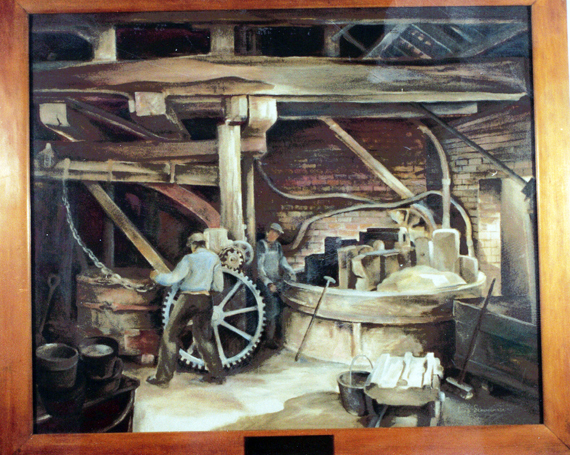 For many years these Historical Society paintings were on display at the Carnegie Public Library, but were placed on loan with to the Ohio State Historical Society with other local society art, ceramic pieces, photos and records when the Museum of Ceramics was opened by the state historical society. SCHWEINSBURG WAS born at Ellwood City, Pa., July 28, 1898, and studied at the Cleveland School of Art for four years, then at the Butler Institute and with a correspondence school. He worked with oil and water color and encaustic -- use of a paint made from a pigment mixed with melted beeswax and resin and after application fixed by heat. He earned extensive recognition for his work, and exhibited not only at the Butler Institute but the Corcoran Gallery at Washington, D.C. and art centers at Chicago, San Diego, Columbus, Cincinnati and Indianapolis. 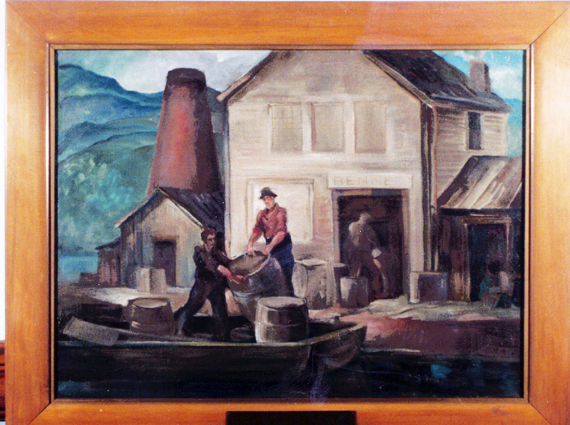 Besides the paintings on pottery manufacture at East Liverpool, he completed 15 on steelmaking under the WPA program. Murals of his are also featured at Struthers High School, Youngstown Masonic Temple and the Post Office at Eaton, Ohio. His first mural design for the East Liverpool Post Office showed an Indian assisting a muscular laborer turning the power drive wheel with cable to an outdoors potter's wheel operated by a bearded artisan. A kiln in a wood shed was in the background. This proposal by Schweinsburg was rejected by the Federal Relief Art Projects of the U.S. Treasury Depart-ment, possibly because a more realistic scene was sought. Officials accepted his subsequent design for the present mural which depicts the Bennett pottery with a two-story frame structure behind a kiln, a shelter house under which a horse is pulling a turnstile that operates the equipment and a shed housing the machinery and equipment. The West Virginia hills and Ohio River are in the background. It was described then as a "modernistic style, featuring contrasting colors in bright greens, reds, brown and other basic hues." His original drawing plan this scene showed some differences, including a man leading a horse from the shed where the mural reveals the horse in front. THE $2,000 WPA mural was funded by Treasury Department art project funds, sponsored by the Chamber of Commerce. It was first placed on display here at the D.M. Ogilvie department store in March 1937. Then it was installed at the Post Office above the Postmaster's office door by government technicians, leading it in after treating the canvass with special preservatives. Application for the federal money was made about two years earlier, and Schweinsburg made a preliminary study, submitting sketches of various proposed views. It took him about three and a half months to complete the work which is 15 feet long and five feet high at the center. 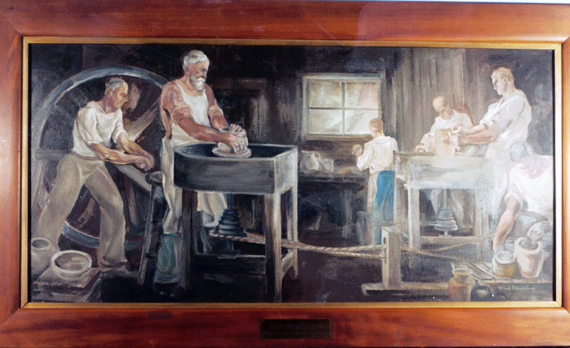 Prior to delivery here, the mural was placed on exhibit at the Treasury Department in Washington along with others in government art projects. It was to be included in a book about art in government buildings entitled "Mural Designs, 1934-36." SCHWEINSBURG may have served in World War One. His was not a happy life, for he became an alcoholic, and is said to have losUiis job with the Butler Jnstitute because of drinking. He and his wife, Betty, suffered the loss of an 11-year-old son, Roland Jr., in 1936 when the boy was struck by a car riding a tricycle near Belmont Ave. The youngster, born in Ireland, was returning from a store where he bought tobacco for his father. Schweinsburg had forbidden him to ride the tricycle after a previous mishap, but the boy had hidden it in a nearby meadow and took it on the trip. Another son, Robert, survived. At one time, Schweinsburg taught art at a veterans' home. The Butler Institute does not have a record of his later life, noting he resided in Youngstown from 1930 to 1955. He is said to have died alone sometime in the mid-1950s. Here is a list of his works at the Museum of Ceramics: "The Throwers," "The Lunch Hour," "The Early Pottery Salesman," "Drawing Kiln," "Drawing Kiln," "The Slip Kiln," "Copper Engraving," "The Decorator," "The Presser," "Kiln Placing," "Packing Ware," "The Old Bennett Pottery," "Shipping Ware by Water," "The Jiggerman," "The Riggers," "Decorating Kiln Placing," "Wedging Clay" and "Making Clay."